It’s the first weekend of Summer in the Seattle area, and I’m so happy the weather finally reflects that! Happy Summer! I’ve baked with deez nuts (Sorry, I couldn’t resist!) before, but not all together in a recipe. Any combination of nuts would work for this, including using just one type. I imagine you can probably even add some dried fruit to the mixture, although I haven’t tried that to be 100% sure. These are based on reworking and modifying a past recipe that I’ve used before, so I was pretty sure they’d turn out. Only thing to be sure they turn out is to let them sit in the tin for 10 minutes to cool slightly, because even when fully baked, it’s a little bit soft on the bottoms until they cool slightly, sort of like cookies. 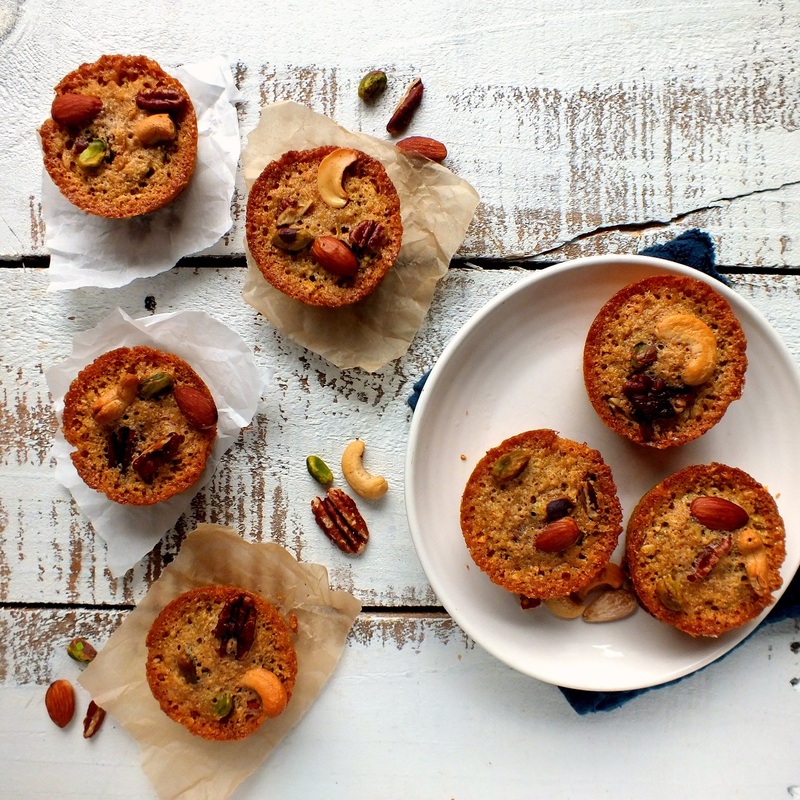 If you want to get all Martha Stewart on this recipe, select the best looking nuts from the container beforehand for the topping of all the muffins to ensure that all of the four kinds of nuts are represented on each muffin top! If you don’t like noticing the oats in it, just place it with the mixed nuts in the food processor, or else use quick oats instead of old fashioned. 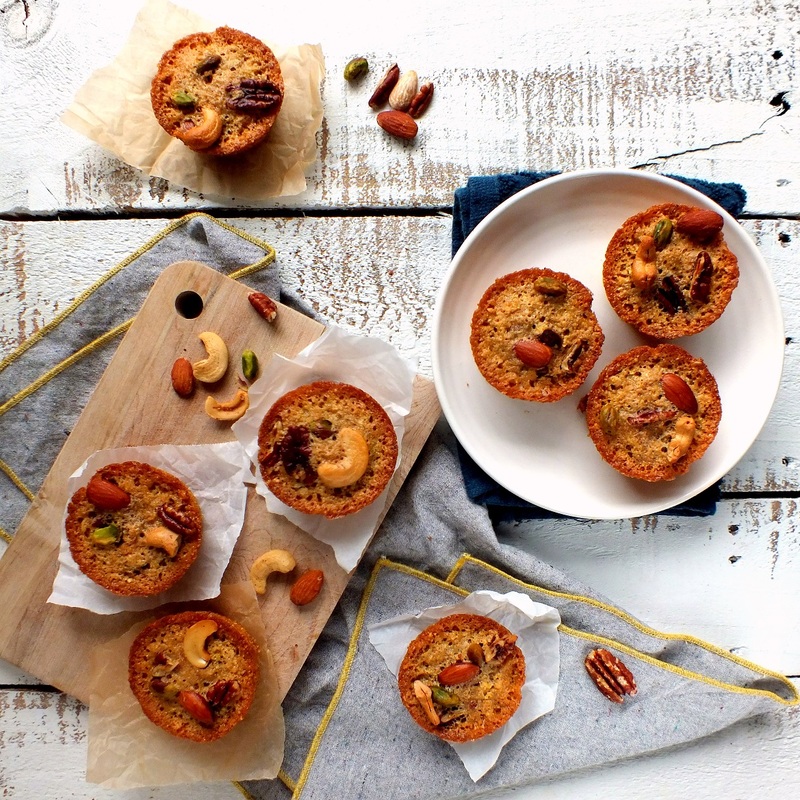 You can also add another half cup of oats to the batter if you want to stretch it to 12 muffins, which is how many muffin molds there usually are per muffin mold trays. Also, if you don’t like using coconut oil, you can use unsalted butter, but then it won’t be dairy-free. But I like how the coconut oil adds to the nutty flavors. It almost tastes like it has coconut meat in it. Prepare a 10-count muffin tin by greasing or lining with paper liners. In a food processor, process the 3/4 cup mixed nuts, until resembling coarse corn meal. Transfer to a medium bowl and add the cornmeal, baking powder, salt, and oatmeal, and stir with a whisk several times until oatmeal, baking powder, and salt are well dispersed with the corn meal and mixed nut meal. In another bowl, cream the coconut oil with the sugar, using an electric hand held mixer. Add one egg, mixing well, and then adding the second egg and mix well again. Add the almond extract and mix well again. Add the mixed nut mixture to the coconut oil mixture and fold together until well combined. Fill muffin molds about halfway up to the top. Place a few nuts on top. 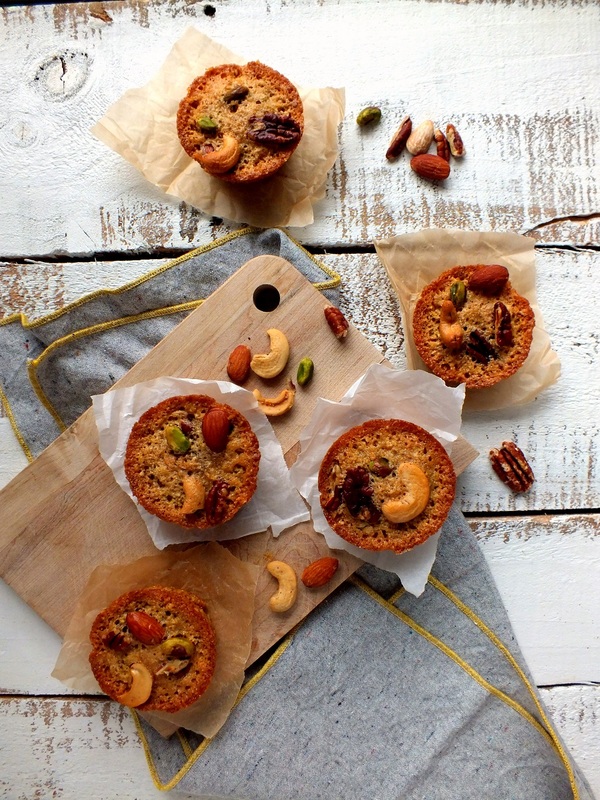 These will sink into the muffin while baking, so if you want them to show, place a few more nuts on top about halfway through the baking time. Bake for about 25 minutes until brown on the edges. Remove from oven and let cool on wire rack for 10 minutes before carefully removing by using a thin knife to loosen the sides. Let cool on wire rack before serving. Serve with a scoop of vanilla ice cream, whipped cream, more mixed nuts, caramel sauce, maraschino cherries, anchovies, mustard, ketchup, caramelized onions, a drizzling of balsamic reduction, gummy bears, capers, maybe even some thinly sliced prosciutto! Just kidding! 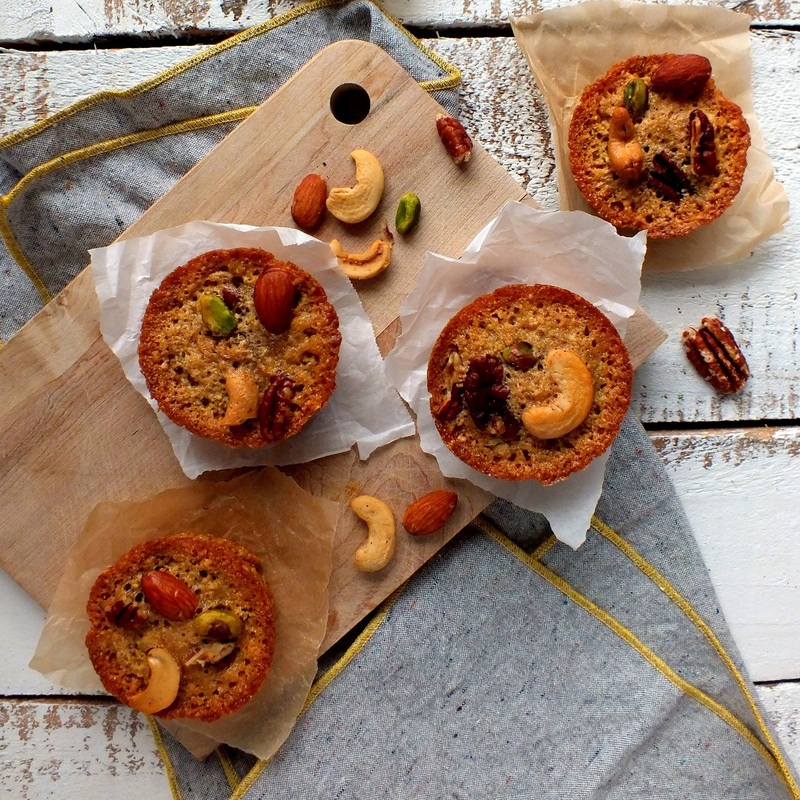 This entry was posted in baked goods, baking, dairy-free, dessert, food blogging, gluten-free, muffins, quick bread, snack and tagged almonds, cashews, mixed nut muffins, mixed nuts, pecans, pistachios. Bookmark the permalink. Aww, thanks! I was surprised how quickly it came together too.! Happy baking!